Newly appointed spokeswoman of the French government, Senegalese-born media advisor Sibeth Ndiaye, has been the target of racist abuse since she was appointed to the strategic position by French President, Emmanuel Macron. There seems to be many in the president’s cabinet or in government who are not pleased with the appointment, especially those who fiercely oppose the policy of Macron. The new secretary of state; a young woman, very brilliant, whose only fault would be to be Black and holding a key position in a French government has since become a victim of racist attacks. Despite the abuse, Sibeth Ndiaye chooses not to be distracted by her detractors but is rather devoted to the service of France. “To serve France is for me first of all to serve all Frenchmen. What I want is for this ministry to be open to them. This ministry, which is often considered as that of the word, I want it to be the one of the listening“, she declared during her swearing in ceremony. After growing up with a politician father and a mother who was president of Senegal’s Constitutional Council, Ndiaye moved to Paris for university studies and became a leftwing student activist before joining the Socialist Party in 2002. 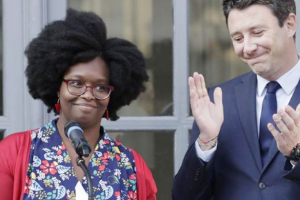 39-year-old Sibeth Ndiaye was born in Dakar and obtained French citizenship in 2016 while working as a communications advisor for Macron’s presidential campaign.